Brooks & Collier's grilling and outdoor kitchen department provides customers with the best and most advanced outdoor cooking options on the market today. 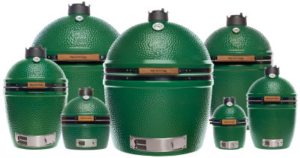 Select from manufacturers like Big Green Egg, the Ultimate Cooking Experience; Blaze Grills, DCS Grills, Lynx Grills, Saber Grills, Smokin Brothers Grills, and Traeger Grills. 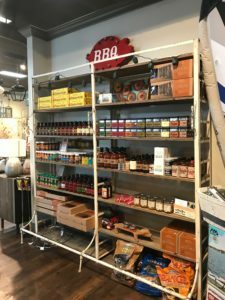 We also offer one of the largest selections of Big Green Eggcessories, tables/stands, rubs and sauces, and other grilling items to satisfy all of your outdoor grilling tastes and needs. The Ultimate Cooking Experience. Widely acclaimed as the original American-designed ceramic cooker, the Big Green Egg® was derived from an ancient clay cooking device known as a "kamado". Originally a clay vessel with a lid, today's EGG® is a modern ceramic marvel known for producing amazing culinary results for novice and experts alike for over thirty years! The all-new ultra-reliable and robust DCS Grills Series 9 delivers the full package of beauty, brains and brawn with impressive new features to cater for a wide repertoire of cooking styles. 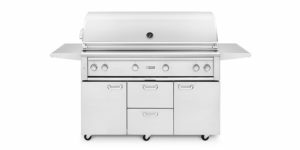 Designed to deliver the functionality and power demanded by a professional chef and hand-finished to a high standard, these grills are built to withstand the demands of the serious cook and the weather, 365 days a year. Juicy! 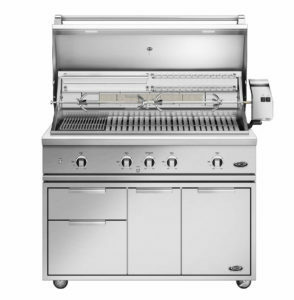 Saber Grills use proprietary infrared cooking technology and a zonal cooking system to let you flame-kiss a steak on high heat while just inches away, you grill a filet of fish over low heat. 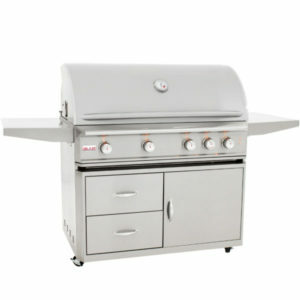 Saber grills also arrest overcooking because of its stainless steel emitter, which prevents flaring and charring. Using 100% infrared (IR) heat rather than direct cooking on a gas grill, for which the heat is hard to contain; or hot air convection cooking that can dry out your food; Saber's unique, patented Saber cooking grate and IR emitter creates dramatic temperature fluctuations and vaporizes drippings to add a natural smoke flavor to grilled foods. WOOD-FIRED - COOKING THE WAY MOTHER NATURE INTENDED. Cooking over fire is what makes us human, it’s part of evolution, and it simply tastes better. MEAT. FIRE. GOOD. 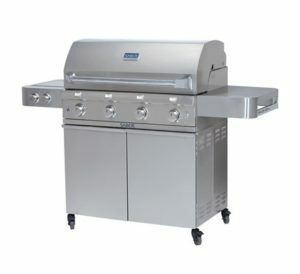 Blaze Grills Blaze Gas Grills offer a combination of solid engineering, quality stainless steel construction and commercial-grade cast stainless steel burners to help ensure your Blaze grill will last for years and provide maximum performance. 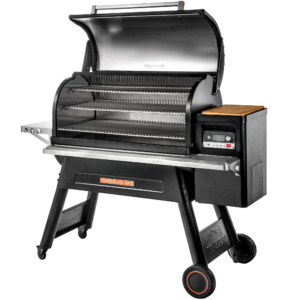 Since its launch in 1996, Lynx Grills Inc. has set the standard for design, innovation and engineering excellence in outdoor grills and custom outdoor kitchen products. The creation of Lynx was the vision of a group of people who for more than 30 years had been manufacturing stainless steel products for the commercial restaurant industry under the brand BECA, and today Lynx uses the same engineering to create grills that are made to last – even under the most extreme weather conditions. 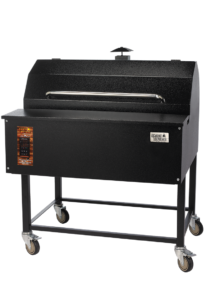 Smokin Brothers Wood Pellet Grills are manufactured and assembled in Southeast Missouri, and are designed to give you consistent cooking every time. They grills cook with indirect heat, preventing flare ups. Each grill comes complete with a drip pan to catch the grease and convection fan to circulate air around the food, eliminating the need for a rotisserie. The digital thermostat control maintains a constant temperature from 180 to 375 degrees and a high setting for temperatures above 400. Simply plug in your Smokin Brothers grill and set it to 180 to start. After lighting, set your temperature as needed and let the grill do the rest. In 10 to 15 minutes you are ready to begin your BBQ masterpiece. We also have a wide selection of rubs, seasonings, wood pellets, and wood chips to make sure what ever you prepare is seasoned to your liking.